Well, it’s November. The second to last month of the year. In January, I chose one word to focus & meditate on throughout the year: discipline. I constantly fail in discipline. Every day, I don’t wake up early enough. I rush through getting ready & race out the door for work. There’s never even time for my Bible to cross my mind, let alone rest in my hands. I have journaled & read the Bible more this year than last, but still very sporadically. I wake up some days with the get-up-and-go to get the dishes done & keep the house clean & fix a meal or two. But others I just sit around & look at Pinterest for hours or binge-watch a random show on Netflix. So I was talking to my sister, Katie, about this last week (you’ve met her, remember? ), and she brought up an image that had been on her mind lately. It was from a trip that we took four or five years ago with her husband, our brothers, their wives, and our sister-in-law’s sister & her husband (I wasn’t married yet). We went up to Minnesota to the Boundary Waters and took a week long canoe trip. Because there were more packs than people, and the guys had to carry the canoes, every time we did a portage (a short hike between lakes), Katie & I would have to carry two packs, one on the back & one on the front. This meant that we were carrying almost exactly our own weight, so it was not easy. Lately, Katie’s been feeling like she’s carrying too much with no end in sight. I, however, feel like I just looked up and realized that I’m only carrying two oars. You know, one for each hand, so I don’t look completely useless. Don’t get me wrong, there’s a time for just carrying oars. In fact, that’s what Diana (our sister-in-law’s sister) did on that trip, since she was pregnant and didn’t need a heavy load. But that’s not where I am in life right now. Metaphorically. I mean, I’m not pregnant, but that’s not what I mean. I don’t have a lot in my schedule besides work & church, so I have plenty of time & energy that is currently being spent on nothing, but should be spent on getting in the Word, keeping house, exercising, and even blogging. So Katie & I decided on a challenge. Together, we’re going to blog every day in November, alternating days. We’re challenging each other to re-evaluate our packs (or lack thereof). 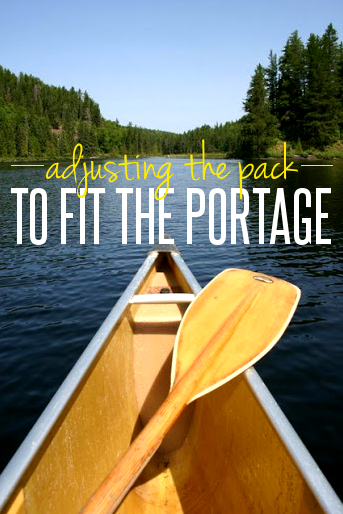 To really look at the portage we’re on right now and see what we should be carrying. We’ll be posting in all the blog categories, so there will be recipes and crafts, but we’ll also be giving weekly updates on what we’re learning through our journaling & time in the Word. Katie is going to be working through the Psalms and I’m going to work my way through Proverbs. There will be plenty of encouraging each other as we go along, and we welcome your prayers & encouragements as well! Cara’s going to take November off of blogging. To extend the metaphor, she’s just carrying too much (she & Matt just started new jobs, & they have a lot of commitments taking up their time right now) so it made sense for her to take a blogging break for a few weeks. She’ll fill you guys in on things more in December, but pray for rest for her this month. You’ll hear from Katie tomorrow, and I’ll see you again on Monday – this month will be an adventure! Awesome metaphor – looking forward to reading about your journey this month!